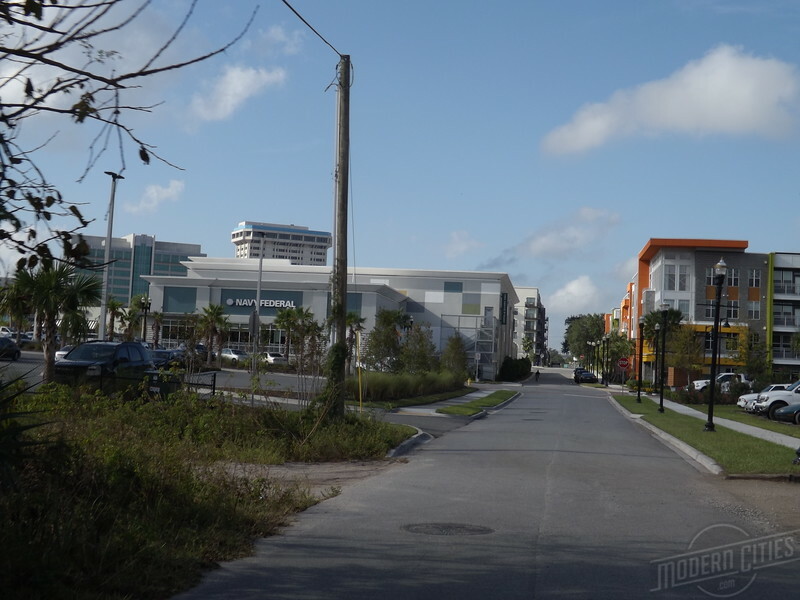 Expanding the Skyway: Where would you like it to go? 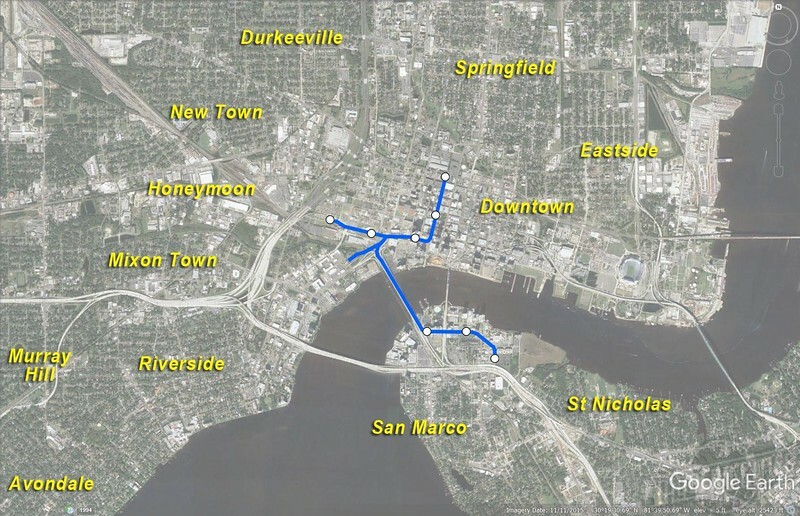 The Jacksonville Transportation Authority (JTA) is seriously considering expanding the Skyway to serve neighborhoods outside of downtown Jacksonville. Where would you like to see the system expanded first? There’s a chance that extending the Skyway to serve more than just downtown could happen in the future. 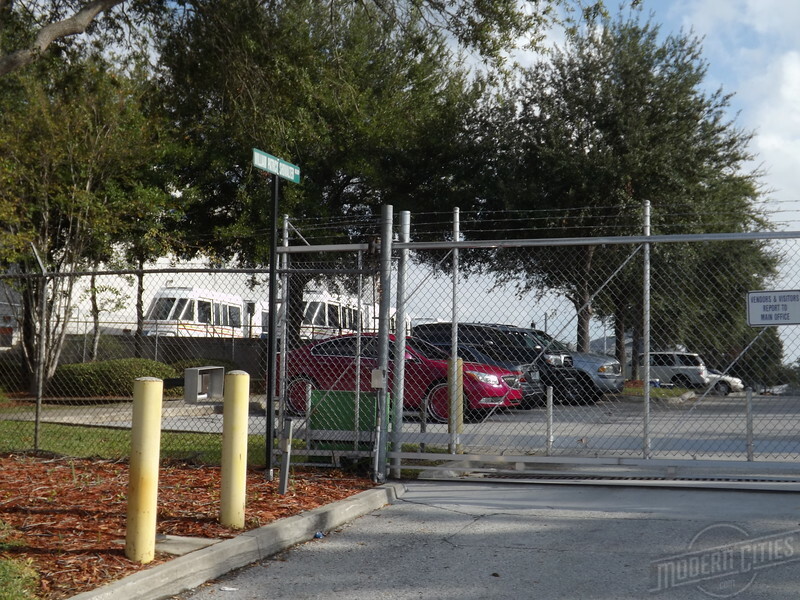 On December 10, 2015, the JTA Board approved a resolution supporting the continued operation of the Skyway and the development of a modernization program for the city’s only fixed public transportation system. The modernization program also evaluates the potential for future expansion of the 2.5-mile bi-directional system, which currently supports approximately 5,000 trips per day. A map of the JTA Skyway system and its eight downtown stations. No one doubts the positive economic impact of having a fixed public transit system linking districts like Brooklyn, Riverside, San Marco, Springfield and EverBank Field with downtown. However, it will cost millions to extend and with limited funds readily available, potential expansion would have to incrementally occur over an extended period of time. A map of the JTA Skyway system with a 1/4-mile or five minute walk radius around its stations. According to the Victoria Transport Policy Institute, typical transit riders will walk up to a 1/4-mile to a bus stop and 1/2-mile to a train station. 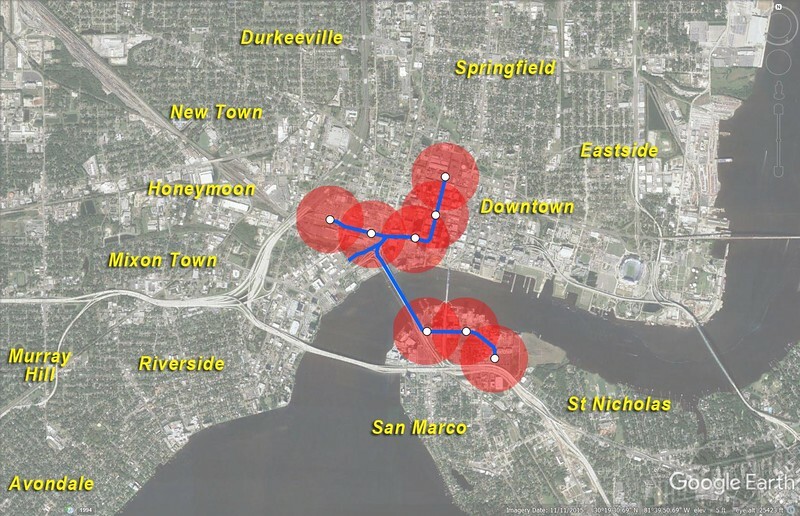 As a part of its evaluation….the Jacksonville Transportation Authority is seeking public input to help the agency determine potential Skyway expansion route priorities. To assist in understanding expansion possibilities under consideration, here’s a look at each destination highlighted in the survey. Brooklyn may be considered the easiest option for Skyway expansion since the transit system’s operations center is already there. Adding a station at the operations center would immediately place Brooklyn Station, Brooklyn Riverside, 220 Riverside, Unity Plaza, Riverside YMCA and a host of office buildings within a five minute walk of the Skyway. A view of new infill development in Brooklyn taking from the front of the Skyway’s operations center. Skyway cars already have access to Brooklyn. Unfortunately, that access isn’t available to the public.